SCI Healthcare has the pleasure of introducing you to the place where your baby will open his or her eyes for the very first time. Our birthing unit treatment meets International Standards of excellence. Our professional and caring medical, admin & support team that have nurtured and assisted more than 750 families during the past few years to extend their services to the birthing unit. SCI Birthing Unit nurses hold a Bachelor of Science -Nursing, General Nursing and Midwifery qualifications with years of experience. Nurses provide most of the day-to-day assessment and care of babies in the NICU. They work closely with parents, neonatologists, and the NICU team to ensure the best treatment for the babies in their care. The NICU (Neonatal Intensive Care Unit) at SCI Hospital is a total 15 bedded unit with 7 Level III, 5 Level II & 3 for separate Isolation. We have 1:2 nursing in Level III and 1:3 nursing in both Level II & Isolation room. 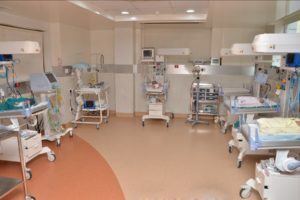 The NICU has been designed as per international guidelines and has the latest infrastructure required for management of extremely low birth weight preterm newborns and other extremely ill babies, in terms of Mechanical Ventilation(conventional and high frequency), continuous positive airway pressure, central arterial and venous catheterization and cardiac monitoring etc. The unit has established protocols for Retinopathy of prematurity, hearing and newborn metabolic and genetic screening as per international standards and also has facilities for 24 x 7 bedside X-ray, ultrasound and ECHO. 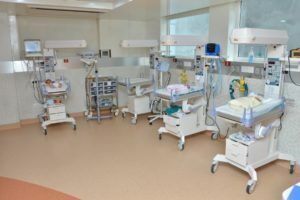 The NICU is fully equipped for various NICU procedures viz. surfactant administration, initiation of ventilation, initiation of CPAP, central venous catheter insertion, etc. The NICU also has its transport team and equipment involved in safe transfer of sick babies from other hospitals and units. SLE4000 Infant Ventilator: One of world’s Best Ventilator, Touch screen control and a comprehensive range of ventilation modalities and monitoring modes. DRAGER Ventilator (Baby Log): High-frequency ventilation with graphic display. GIRAFFE Incubator: For extremely low birth weight babies less than 1000 gm or less than 30 weeks gestation period. SLE1000 CPAP: The SLE1000 is a revolutionary CPAP (continuous positive airway pressure) machine, a servo-controlled CPAP unit with intelligent alarms and modern electronics. MULTI PARA MONITOR: Multi Para monitor with Invasive BP monitoring & Pulse-Oxymeter with Pulse strength indicator & Masimo technology. 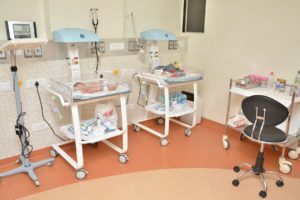 SCI birthing unit has world-class Obstetricians, Paediatricians and Nursing staff who are trained in the most up-to-date birthing and neo-natal medical care. They are equipped to deal with any neonatal emergency. Specialist care is provided for sick, premature and extremely low birth weight babies.